When dental technicians have to fabricate a prosthetic tooth crown, they must be familiar with the normal form (norm) and then individualize it to match the given case. The alternative—knowing all the individual cases and picking out the right one as needed — is simply not feasible. Any description of tooth forms is based on statistical mean values, which are used to work out the normal shape of the tooth concerned, ie, an ideal form. Individual variations are noticeable when looking at a natural tooth. These variations are mainly deformations of the original form caused by wear. Dental enamel and dentin are subject to mechanical wear known as dental abrasion (abradere = to shear off). Abrasion is the rubbing and erosion of the natural or artificial tooth surfaces by the act of chewing, resulting in the wearing away of incisal margins, occlusal surfaces, and approximal surfaces. The mechanical loss of hard dental substances both occlusally and approximally is known as horizontal and vertical abrasion. It appears in the form of functional surfaces (ie, incisal margins and occlusal surfaces) being altered by demastication, attrition, and artificial abrasion (defined below). Normally, abrasion is physiologic wear and can be seen as a functional adaptation: The incisal margins wear each other away like the blades of scissors; the occlusal surfaces lose their high cusps and fit into the abraded surfaces of the opposing teeth (antagonists). If the dentinoenamel junction is reached because enamel (which cannot regenerate) is abraded, dark, yellowish-brown lines and spots appear, and abrasion cavities are formed. The pulp chamber is not generally exposed because secondary dentin is constantly being formed (Fig 4-11). Demastication is the physiologic wear on teeth as food is crushed, caused by the abrasive force of the food and its impurities. It mainly affects the incisal margins and the occlusal surfaces. Attrition is the sharply demarcated wear on teeth resulting from friction caused by movements with the empty mouth (ie, parafunctions such as clenching or tooth grinding), so that typical wear facets appear. Artificial abrasion is the wearing down of hard dental substances as a result of artificial external factors, such as the indentation (erosion) of incisors in pipe smokers. Generalized abrasion means heavy wear on occlusal surfaces with typical lingual inclination of the occlusal surfaces (abrasio ad linguam) in large mandibles, palatal inclination (abrasio ad palatum) in the case of a large maxilla, or horizontal inclination where the jaw size is well balanced or there is a reverse articulation. 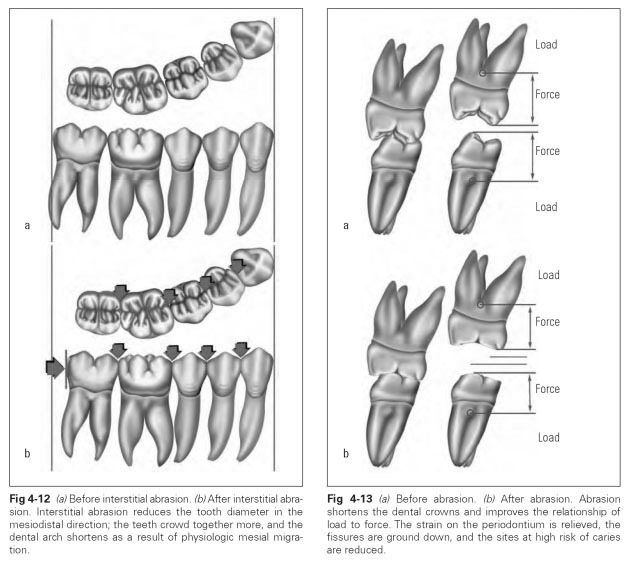 Interstitial abrasion arises as wear on the ap-proximal contact points caused by natural tooth mobility, so that the mesiodistal tooth diameter shortens, which is compensated for by the physiologic mesial migration of the teeth (Fig 4-12). Wear facets are the worn areas on natural teeth caused by abrasion. Their typical form and position can be used to identify teeth because very specific wear facets are formed as a result of the position of the antagonists. This raises the question as to why the teeth do not erupt already in a functionally abraded form, but this is based on a false premise. Instead one should ask what is the basic function of highly developed, nonabraded teeth. The answer is that the steep cusps ensure that the teeth find their correct position as they erupt.The emerging teeth are guided by the profile of the occlusal surfaces of their antagonists. During chewing function, they then wear each other down to their eventual form. This means that the dental crowns are shortened, which im- proves the relationship of load to force and takes the strain off the periodontium (Fig 4-13). When the fissures are abraded, this also reduces the sites where caries can attack. A specific system is used to describe the teeth in the following sections: The names and general descriptions are given first, and the functional aspects of the individual teeth are then examined in detail. The actual topographic description emerges from the sequence of surfaces: vestibular, lingual, mesial approximal, and occlusal.